Aside from a few specific design choices, everyone has ears, and each person’s ear is as unique as his or her footprint. That means as long as you get the major components and the ears somewhat resemble each other, you are successful! If you follow these easy steps, I promise you will stop hiding ears under hair, hats, or hoods. Draw a rectangle for the ear. 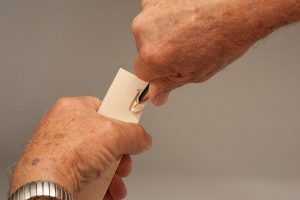 Make a stop cut along the top of the rectangle with a carving knife and cut down to the stop cut. 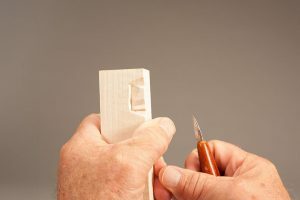 Make a stop cut on the bottom of the rectangle and cut up to the stop cut with a carving knife. 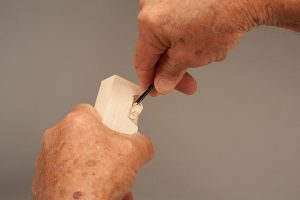 Make a stop cut on the outside line of the rectangle with a 3/8″ (10mm) #3 gouge and cut up to the stop cut. Taper the top outside edge of the ear. Use the carving knife. 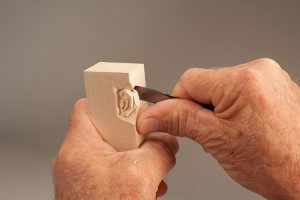 Then, carve the notch into the side of the ear with the carving knife. Round the outside bottom corner of the ear. Use the carving knife. Shape the tragus. The tragus is the little flap of skin sticking out of the near the face. Make a stop cut around the tragus with the carving knife and cut up to the stop cut to make the tragus stick out. Carve along the inside edge of the ear. 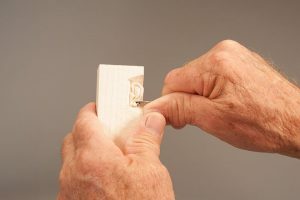 Use a 1/8″ (3mm) V-tool. Deepen the area around the tragus. Use the 1/8″ (3mm) V-tool. This creates a realistic shadow around the tragus. Round the edges of the ear. 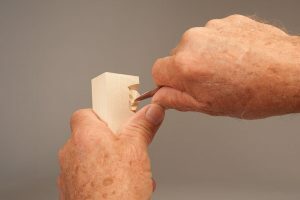 Use a 3/16” (5mm) skew chisel or the carving knife. Carve the hole in the ear. 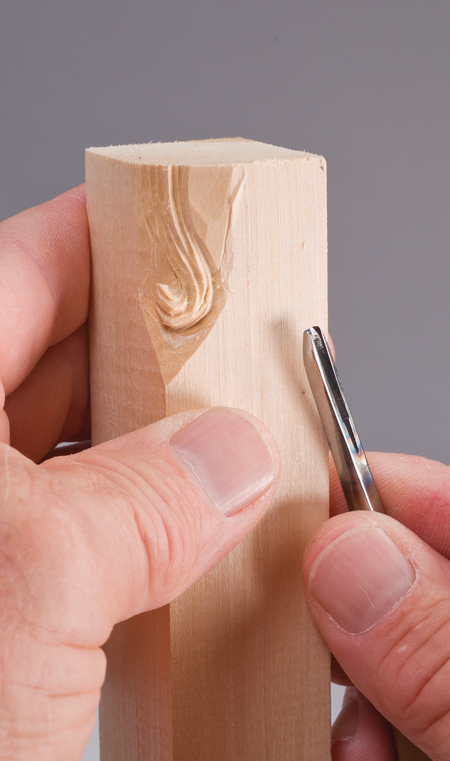 Make a deep cut with a 1/8″ (3mm) #5 gouge. Position the hole just behind the tragus. Shape the inside of the upper ear. 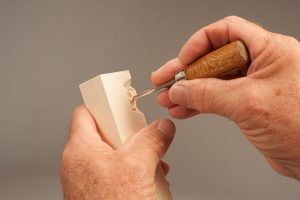 Use a 1/16″ (2mm) #11 gouge to carve the “Y” at the top of the ear. 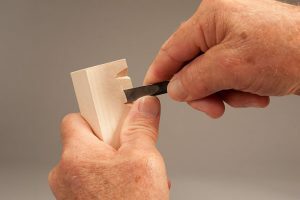 Refine the area and round over the sharp corners with a micro gouge and a detail knife. Refine the edges of the ear. 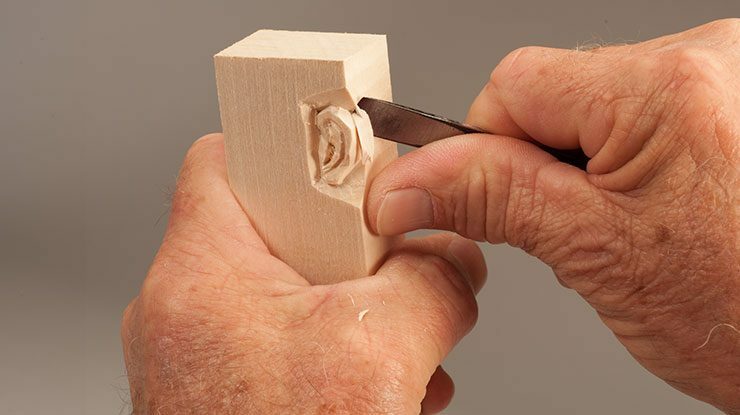 Use the 3/16″ (5mm) skew chisel and the carving knife. Round over any sharp edges. Undercut the back of the ear. 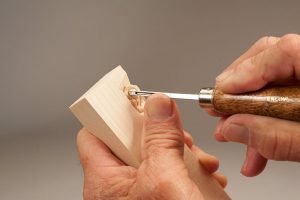 Use the 3/8 ” (10mm) #3 gouge. Refine the back of the ear with a carving knife. Harold Enlow was the first Woodcarving Illustrated Woodcarver of the Year in 2001, and he is considered one of the grandfathers of caricature carving in the United States. Harold was one of the founding members of the Caricature Carvers of America, but is now an emeritus member. For more on carving facial features and distinctive faces, see Carving Faces Workbook by Harold Enlow. 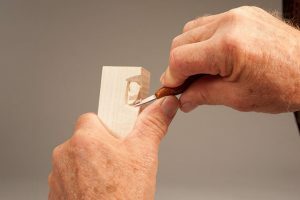 Pull up a seat next to Harold’s carving bench as he teaches you how to carve faces with life and expression while sharing decades of carving tips and techniques. The book is available from www.foxchapelpublishing.com for $19.95 plus S&H.